Alongside minty fragrances, I’m a sucker for something with a hint of leather. Tom Ford Tuscan Leather, however, doesn’t contain a hint of leather, it’s a full-on smack in the face with a driving glove. My first introduction to leather scents was with Serge Lutens (or, dear old Uncle Serge as I refer to him for some reason) Daim Blond, to me, everytime I sniff it – I don’t own a bottle – I think it’s the very essence of how a suede rose would smell, if such a thing existed. Tuscan Leather isn’t as lady-like – or as genteel – when first sprayed it is the very essence of a leather armchair that’s spent many years in the corner of a gentlemens’ drinking den, absorbing the aromas of brandy and cigars. And, of course, with a hint of the leather itself underneath. This isn’t for everyone, but for me, I adore it. It’s another “dry” scent, without much in the way of sweetness on my skin (although one of the notes a lot of people talk about is raspberry), and I like it all the more for that. It’s masculine-seeming on first spray, but the dry down turns it more into a skin-scent, meaning you have to get close to smell the notes, and you will occasionally be able to smell yourself. I have a scarf that’s been impregnated with the smell of this now, and it’s something I occasionally wrap around myself and sniff just for the pure pleasure of it. 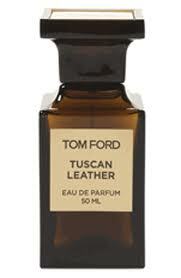 Tom Ford Private Collection Tuscan Leather retails for £115, and is available from Selfridges. The Fine Print: Revoo written from samples. I love leather scents and Daim Blond is one of my faves. I've never sniffed Tuscan Leather – but I definitely will now when I next see it. I really like the Oud Wood from Tom Ford – it smells like a gentleman's club/library crossover.